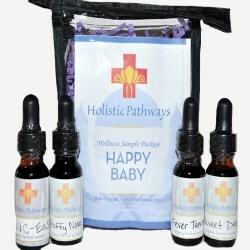 Happy Baby Sampler Package: Four 0.5oz bottles. Everything you need to care for your little one with natural remedies. Herbal extracts of: Fever Tamer, Stuffy Nose, Sweet Dreams and Colic-Ease. These remedies are tried and tested to work efficiently and your baby will love the taste!